This is a super fast and super easy knit and the finished sweater is super cute. I just hope the baby actually turns out to be a girl. The parents couldn’t tell from the ultrasound if the baby is a girl or a boy who is really, really, really shy about flashing the world his private parts. The pattern only calls for 7 buttons. Frankly, you could probably get away with having only five. But thanks to my Amazing Math Prowess, I put in 8 buttonholes, so 8 buttons it was. Also, the pattern calls for over 600 yards of a worsted weight yarn to finish this size; I needed less than 400. 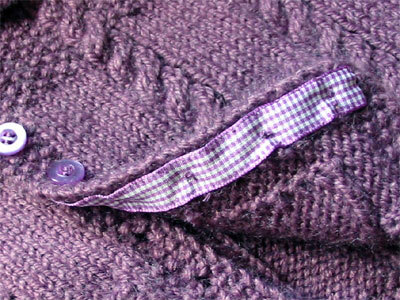 See the pretty ribbon reinforcing the button band? Yeah, I didn’t do any of that. I didn’t sew the buttons on either. My grandma was visiting, so I approached her with my arms full of sweater, ribbon, thread, and buttons, and a hopeless puppy look on my face, and she installed all that for me. And she taught me how to attach buttons securely. Hooray for grandmas! 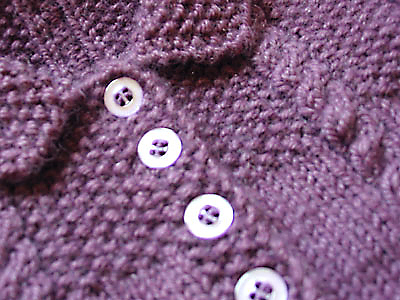 CogKnition posted this on October 8th, 2007 @ 5:49pm in Baby Items, Finished Objects, Sweaters | Permalink to "Cable and Seed Stitch Jacket"
Your grandma rocks. Perfect touch to a sweater that nearly makes my uterus ache. 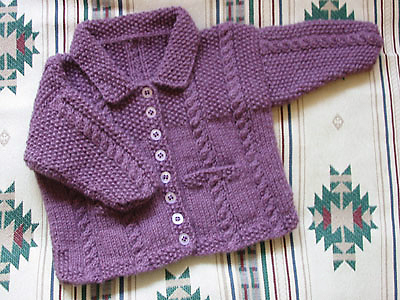 How can I get a copy of the Cable and Seed Stitch Baby Jacket pattern?